Well, after the insanity that was last week, it was nice to see the trend continue with another strong lineup of games this week. Of course, that also makes picking the Game of the Week a difficult task, but trust me, I’d rather have to make a tough decision about too many great games than have to settle for something that’s the least crappy of the bunch. This week I went with a game I feel is a shining example of a great mobile game: Zach Gage’s Sage Solitaire (Free). Why is Sage Solitaire a great mobile game? Well first off, it’s familiar, as it blends together two well-known concepts: solitaire and poker. A deck of cards is shuffled out into a grid of 9 piles. The top card on each pile is facing up. Your job is to create poker hands out of the face-up cards, and try to continue to do so until you’ve used every card in the deck. Sounds simple, right? Well it is, but it’s also nuanced and pretty complex. There are several factors that give this simple idea purpose and add strategy. First, you need to make your hand from at least two rows. I imagine if this rule wasn’t imposed the game would be too easy and you’d clear the board nearly every time. However, to balance out it being too impossible to win too much of the time, you also have two “trash spots" you can discard a card to when needed. You can even gain back used trash spots by making hands, so it’s a really handy tool. Another wrinkle is that one card is dealt to the side at the beginning of every game, and the suit of that card is your bonus suit. Make a hand with at least one card of that suit and you’ll get a scoring bonus. However, the bonuses don’t stack, so an added strategy is to not use more than one of that suit in a hand if you don’t have to in order to increase the potential of you being able to use it in a future hand. 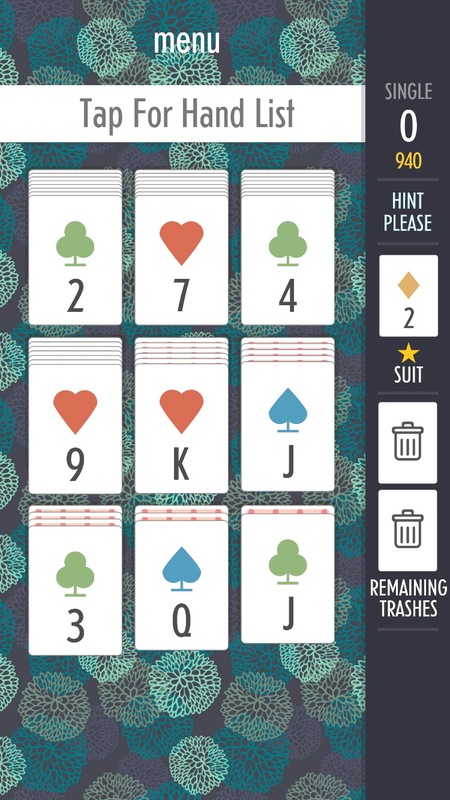 Sage Solitaire also makes a great mobile game because its sessions are so quick. Normal solitaire is pretty quick too, but these are even faster. Of course, once a game ends the “one more go" urge is extremely strong, so it’s nice you can fit in multiple games in even shorter game sessions. It reminds me a lot of Threes! ($5.99). It’s easy to pull out of your pocket even if you haven’t played in a while and instantly recognize what’s going on in a game and be able to focus your attention on it. Then just like a light switch you can turn it off and snap back into the real world in a heartbeat. It’s not simple enough to be mindless but not so involving that it requires your brain to shift gears in order to enjoy, if that makes sense. Finally, Sage Solitaire’s pay model is really nice. It’s a free download supported with very infrequent ads. In fact, ads don’t even start running until after you’ve completed at least 3 games, in order not to scare you off. $2.99 unlocks the full game which disables ads, adds two new game modes and a number of different backgrounds and card backs to customize your game with. The new game modes are Double Deck, which lets you play a normal game with two decks at once, and Fifteens Mode which adds equaling 15 an additional hand you can play. Both the new modes and the customization options are well worth the money if you like the free taste. 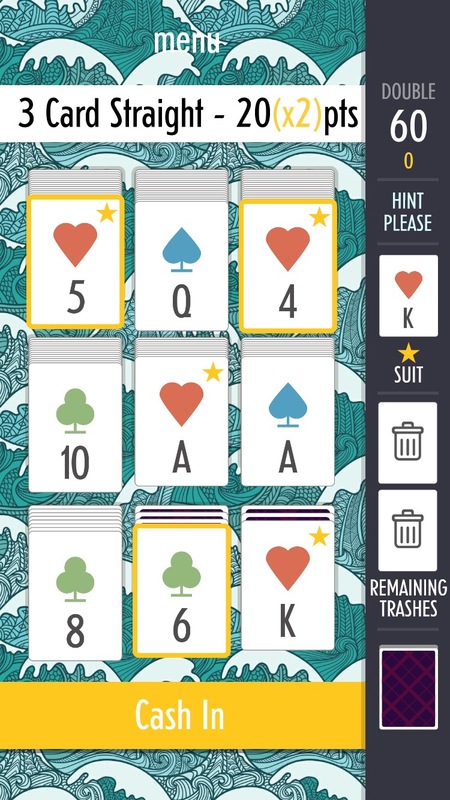 I’m still figuring out new strategies and continuing to be surprised by Sage Solitaire. I have a small collection of ultimate go-to games and it didn’t take long for this to make it into that club. If you like solitaire and/or poker or you even think you might like them there’s no reason not to give the free download a try, but don’t be surprised if you find yourself pulling your phone out of your pocket even more than usually this weekend to sneak in a game or three.